This was a bit of an experiment of just chucking loads of things in so the measurements may not be exact – just play around with it but keep the basic principles of the recipe. It looks like a lot of ingredients but its a simple soup to make and ready in 20 minutes. To make vegetarian – replace meat and fish with Tofu slices and change your stock..
Cornflour starch – made from 1 table spoon of cornflour and 2 tsp water. More if you want a thicker consistency. you could also use some slices of tofu if you want to make this a vegetarian soup or add noddles to pad it out into a main meal. 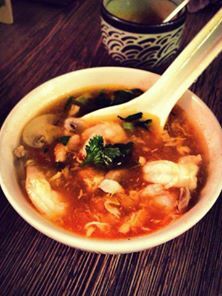 In a saucepan, combine the chicken stock, mushrooms, bamboo shoots, root ginger, garlic, soy sauce and crushed chillies. Bring to the boil, then simmer. Increase the heat to medium, add the chicken, white wine vinegar, lime juice, sugar, tomato puree and sesame oil. Return to the boil and then drizzle in the egg while stirring slowly. Simmer on medium heat until the chicken is cooked through and the stock has thickened. Check the seasoning and add more soy sauce and lime juice if required. Garnish with chopped spring onion and coriander.